I've got to get from Old Street to Lewisham this afternoon. 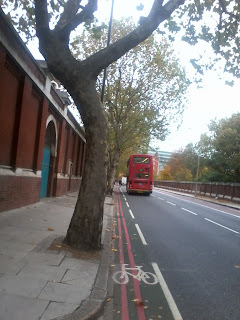 TfL's Journey Planner proposes a back street route which I'm sure will be one of the London Cycle Network (LCN) routes. It's got more twists and turns than Dan Brown's Da Vinci Code. I'd be happy to give it a go if I knew it was an identifiable, signed route. The trouble is that most of the LCN is a convoluted mess for reasons I won't go into now. However there must be a couple of routes that are pretty well thought through and signed, such as LCN 3 in Lambeth from Clapham to Waterloo. So, how bloody stupid are TfL that neither their Journey Planner nor their Local Cycling Guides (aka maps) flag this handful of useful, signed routes up. 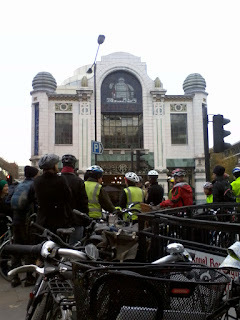 The consequence is that I'll be taking the Old Kent Road instead of TfL's suggested route. I know I can follow that without stopping every couple of hundred yards to peer at a map at dusk. Where does Road Tax go? There is no such thing as Road Tax, though the Advertising Standards Authority doesn't object to car advertisers using the term. 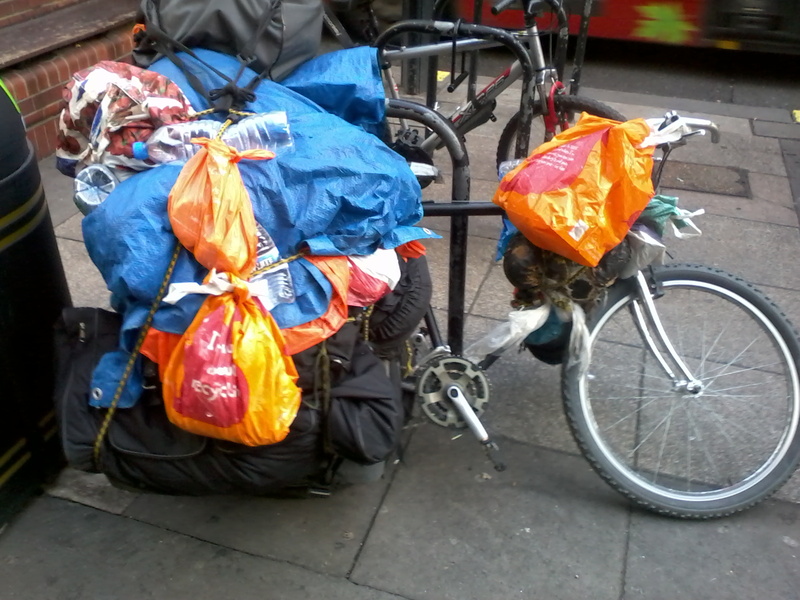 Some motorists strop about cyclists not paying road tax and object to them using the roads. The reality is that roads are paid for out of general taxation, such as council tax. Anyway, motorists actually pay Vehicle Excise Duty (VED) based on their vehicle's CO2 emissions, so a cyclists would pay £0 even if they had to pay. But, for a moment, let's pretend Road Tax to spend on roads exists and raises the money that VED raises. In 2009 government revenue from VED was £5.63bn. 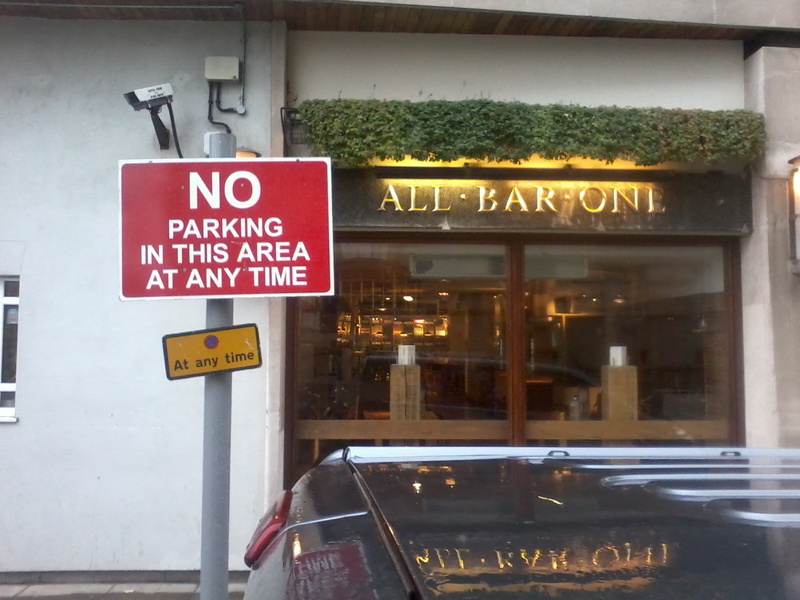 'War on the Motorist'? I don't think so. Mind you, I can't help but feel that a better use of that cash would have been to build a splendid motor-traffic free cycle route along the south bank of the Thames. 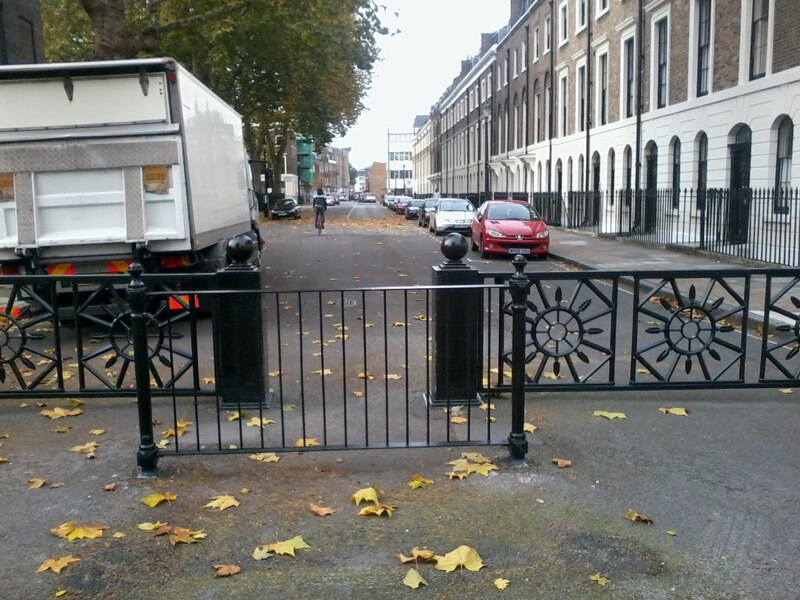 The powers don't talk of providing an alternative traffic-free cycle route along the Thames with views of Parliament, yet this road in St Thomas' Hospital grounds is clearly perfect for that role﻿. You can follow it around to the entrance of St Thomas' and then straight across the Toucan to Belvedere Road. The joy about pootling along the Thames on a bike is that a few quiet minutes later you're halfway to Battersea, able to look back where you came from. Lambeth Cyclists have a track record of excellent Architecture Rides and their next looks set to be a real hit. Finish at Ealing Broadway, about 4.30pm. Eye, Eye, Eye, What's going on 'ere Mr Kafka? This weeks Lambeth Life states that the London Eye is the most popular paid tourist attraction in the UK, with 3.5 million visitors annually. Before developers are given permission to build the council negotiates something called S106 Funding with them - a charge to mitigate the impact of a development. For example if a developer wants to build 500 houses they may be required to build a new school to cater for the influx of new residents. 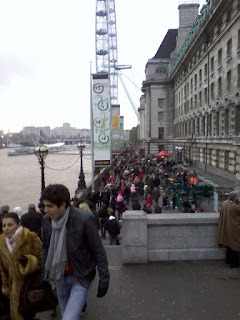 A clearly forecastable impact of permitting the building of the tallest Ferris wheel in Europe opposite Big Ben would be hugely increased numbers of people using the Thames Path and one trusts that S106 money would be used to ensure continued access to the rightful existing users of the Thames Path, such as cyclists (see the markings in the tunnel above). 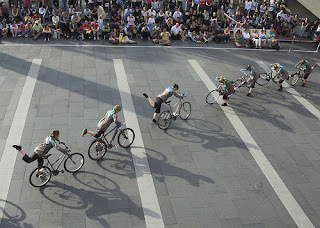 Instead, in a Kafkaesque nightmare, London Eye S106 money has been used to commission the South Bank Employers Group, now chaired by the man who runs the London Eye, to write the South Bank and Waterloo Cycling Strategy, which in its draft 100 page state recommends banning cycling here. 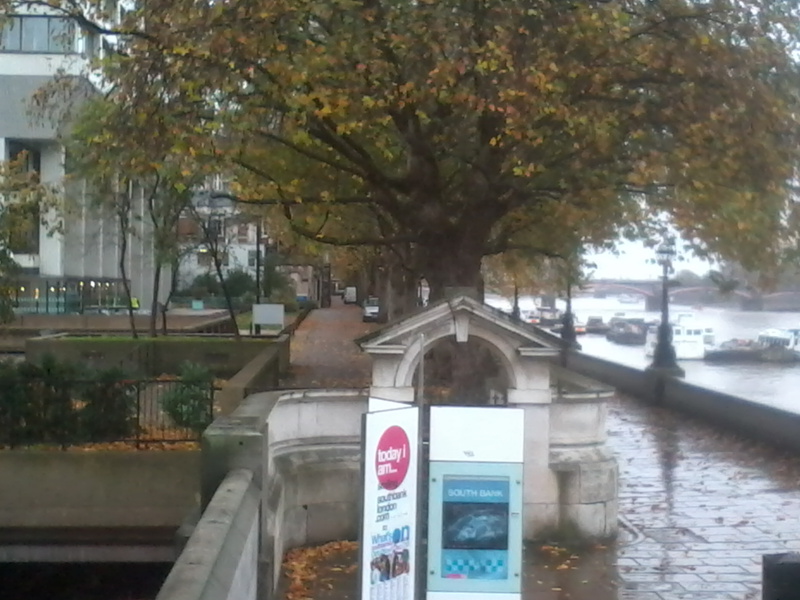 Wouldn't it be better for that S106 money to be used on widening the Thames Path, for example by creating a cycle track on the St Thomas' Hospital space adjacent to the Albert Embankment part of the Thames Path. 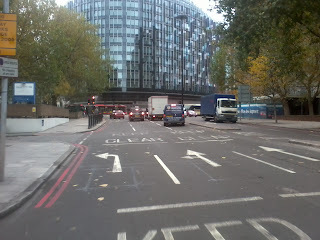 In June 2009 Dennis Putz, drunk driver of a 32-tonne tipper truck, killed cyclist Catriona Patel by Oval tube station at the junction of Kennington Park Road and Harleyford Street. He's been sentenced to seven years in prison and banned from driving for life. But, when you find out his driving history, I expect you'll be asking how the hell the authorities allowed him to have a licence to drive a 32-tonne lorry and how many similar drivers are legally permitted to drive on our streets. The Streatham Guardian states, "It was revealed during the trial that he had 20 previous disqualifications, three drink drive convictions and three previous convictions for reckless driving." The court heard that Putz had been jailed twice before for driving offences, a six-month sentence in 1995 for reckless driving and, in 2003, after 16 counts of driving a lorry while disqualified. He was first disqualified from driving as a teenager, but still managed to get a licence and work as a HGV driver. I expect you're also wondering about the recruitment and operating standards that companies operating this type of lorry have. 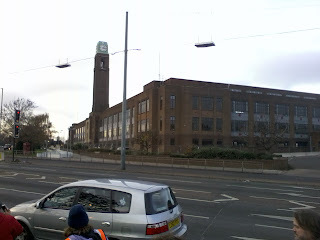 Companies such as Thames Materials Ltd., Dennis Putz's employers. I'm sure there would be a public inquiry if such appallingly lax standards resulted in a train crash. In 2009 there were just over 222,000 road casualties in Great Britain, with 26,912 people killed or seriously injured. This is surely unacceptable. 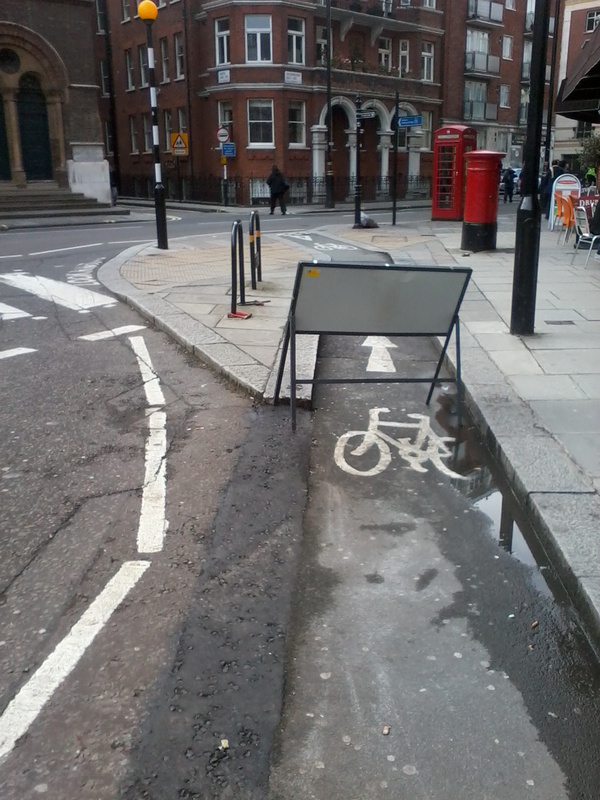 Is it any wonder that people prefer to cycle on traffic-free routes such as the Thames Path instead of the adjoining A road alongside St Thomas' Hospital. I have received another email from a parent replying to my request for volunteers to send their children to ride this road, given the local politician's plan to ban cycling on the Thames Path. "I am definitely not going to let my daughter, who daily cycles to school, do your proposed journey." I think the parent shows admirable common sense given that the licensing authorities and employers allow people like Dennis Putz drive 32-tonne lorries on our local roads. 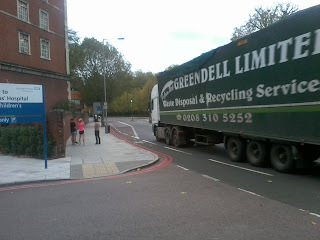 The pedestrian on Camberwell New Road was holding her nose to try to block out the smell and pollution from someone burning tyres or similar. 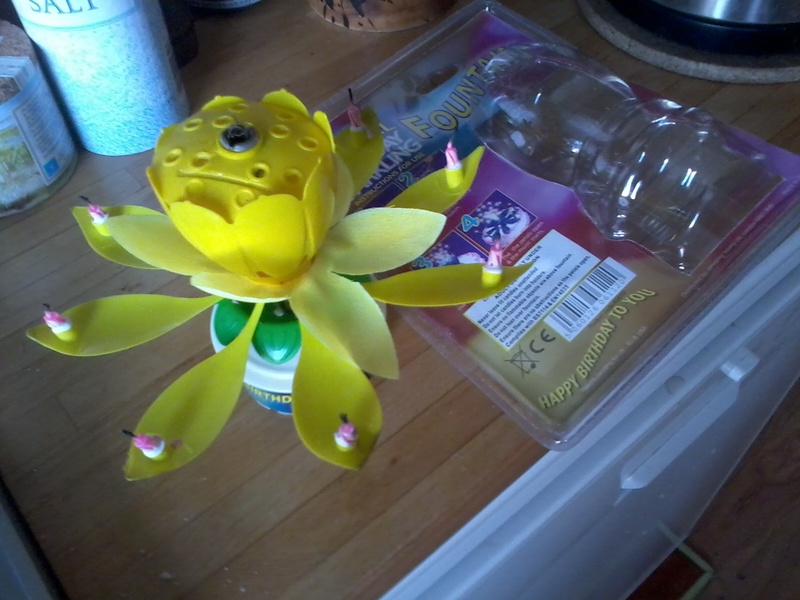 At least, that what I thought the smell might be as it hit me. 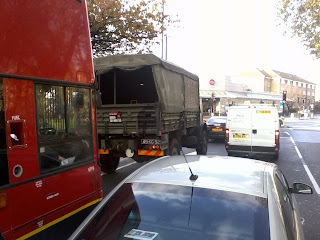 It turned out to be the totally foul exhaust from the army truck pictured - worse than the average black cab by a huge factor. Army Driver, Be the Best says the advert on the back. What are the odds the army are exempt from the rules of a Low Emissions Zone? 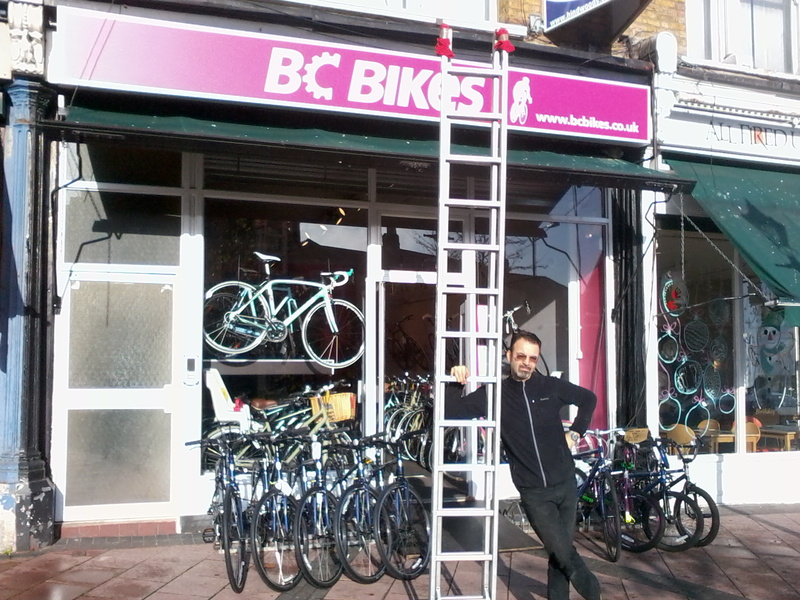 Pim, mechanic on our Monday evening workshop, has a good relationship with BC Bikes in Goose Green, East Dulwich. 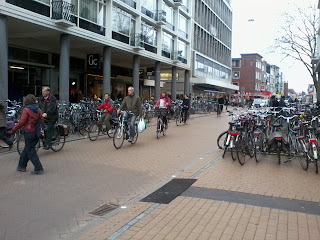 BC Bikes have had a successful couple of years since opening and have moved a few shops along to a bigger, better shop. 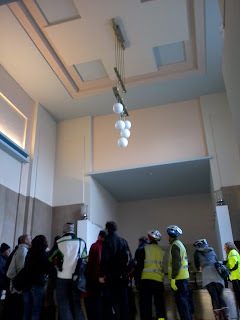 Pim explained about Pedal Power and asked whether some of the old fittings could be given to the project. The nice guys at BC said yes, so Pim went in to the old shop with a screwdriver and ladder, and all being well a range of hangers, hooks and slatwall will arrive in Kennington next week. 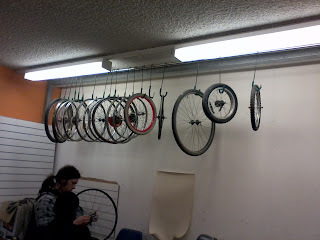 A big thumbs up to Pim and BC Bikes. 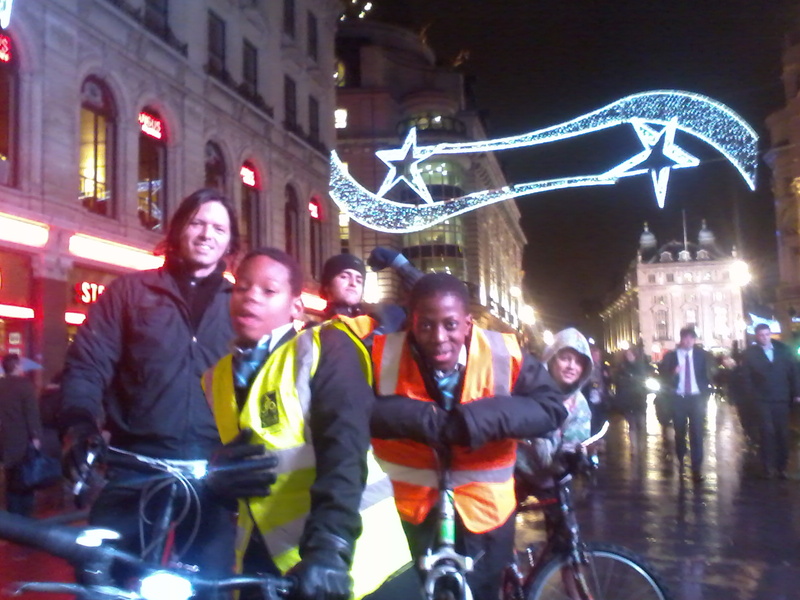 After the seemingly obligatory hour spent fixing mechanical issues and attaching lights, the Pedal Power Kennington ride to the xmas lights in Regent Street and Oxford Street was ready to go, but with a deadline to be back in 45 minutes! A light drizzle for a few minutes didn't dampen our spirits and made the West End all shiny. We went up to the Mall, through to Trafalgar Square and up to Piccadilly Circus. A quick glance at the lights on Regent Street then it was across to Leicester Square, down to Trafalgar Square, along Whitehall and back across Lambeth Bridge. Two of the lads hadn't ridden with us before and totally loved it. Where next? The 10 - 16 year olds at our community cycling project, Pedal Power Kennington, choose a bike to do up that they'll get to own when they've finished. 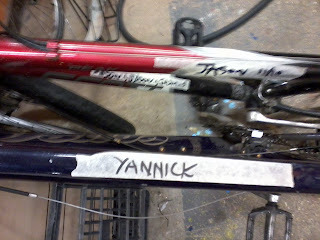 Masking tape with the person's name is put on the frame so we remember that bike is allocated and who's working on it. 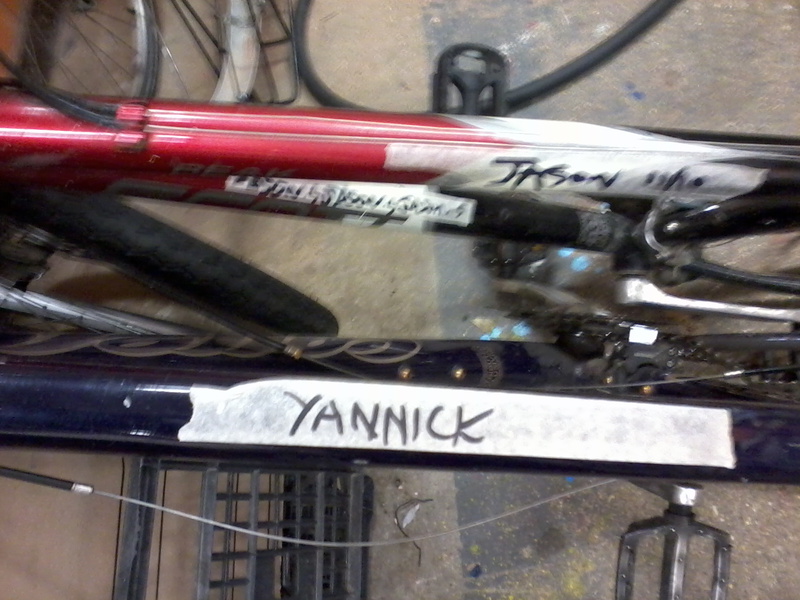 It surprises me how many bikes have tape one moment, then none the next with some chancer asking to work on the 'unallocated' bike. 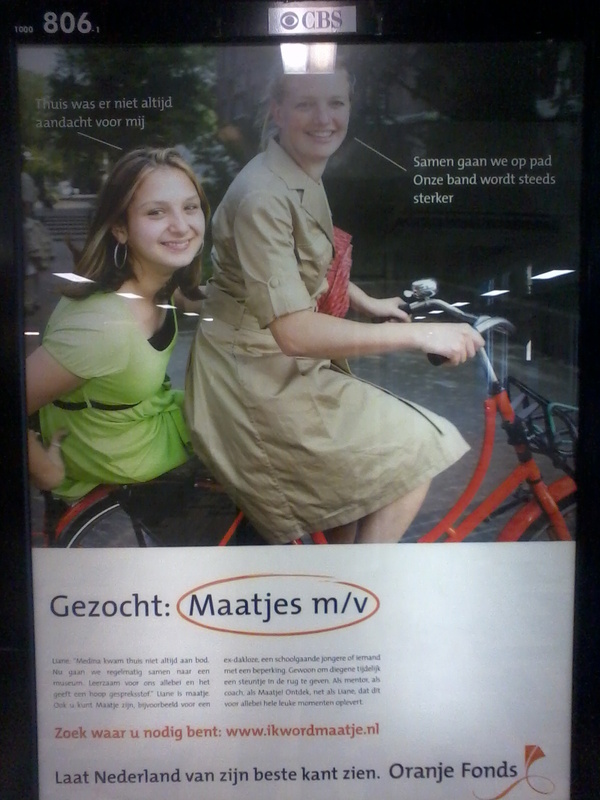 So now we have to take photos of the bike with the tape on so we double check before allocating bikes and relabel it correctly if the tape's disappeared. Cyclist reduction strategy in Petty France? The tourist axis of London has shifted and the South Bank is firmly within the central London theme park with world class attractions from Westminster to Tower Bridge. Attractions, such as the Brunel Museum increase the reasons to follow the river eastwards to Greenwich, the Dome and the Thames Barrier. Westwards will see the new American Embassy, the 'new' Battersea Power Station (planning permission approved this week), joining Battersea Park with its peace pagoda and Hampton Court. 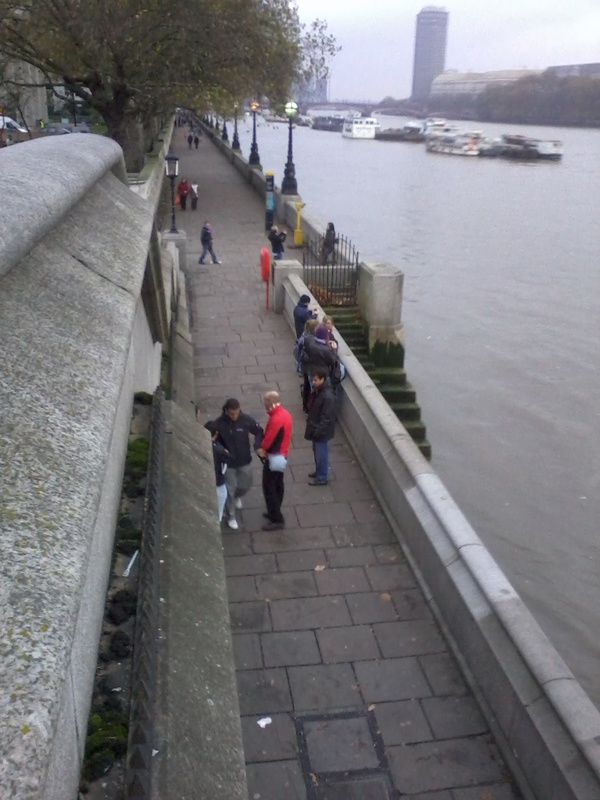 You couldn't choose a more perfect place to have a sensational cycle route that families and unaccompanied children, Londoners and tourists, can follow along the Thames without the peril, congestion, noise and pollution of motor-vehicles. 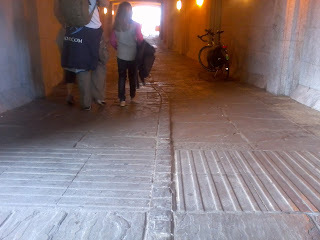 In name it's there - National Cycle Network route 4 - but the reality of it is grieviously at odds with its grand title. 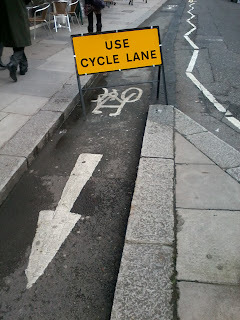 Why haven't the planners, politicians, health service and TfL made an awesome cycle route a priority? They know the reality of peak oil; they know we and our children are unfit, diabetic and obese; they know we need to reduce CO2 and particulate emissions. But instead of making progress, the ambitions of our local politicans appear to be limited to banning cycling from the Thames Path, with our MP of the view that her patch of National Cycle Route 4 is excellent. A week ago I emailed a few local parents to ask if they'll send their children out to considerately cycle the National Cycle Network route 4 from Black Prince Road to Gabriel's Wharf, returning via the Thames Path, to get their comments on each. I wouldn't dream of allowing my children to cycle unaccompanied round the roundabouts at Lambeth or Westminster Bridge - I consider them far too dangerous. In fact, I never cycle around the junction at Westminster Bridge myself - too many lorries! 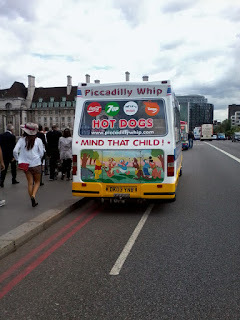 What would a permit cost for two ice cream van pitches on Westminster Bridge, twixt the London Eye and the Houses of Parliament, for several hours a day during the summer holidays? A hefty amount I'll bet, not to mention being charged the on-costs of altering a Traffic Management Order and re-routing a red route, bus lane and cycle lane. But what did it actually cost the owners of the two ice-cream vans routinely flouting the red route, bus lane and cycle lane this summer? TfL reported to a local Councillor that 20 Fixed Penalty Notices (Traffic Offence) and 17 Penalty Charge Notices (Refusal to Move - Obstruction) were issued over a 53 day period covering half of July and all of August. One arrest was apparently made but I bet that no charges were made. TfL don't say what the penalty charges are on their website but, from a Google, I believe the FPNs would be £50 each and the PCNs would be £120 (reduced to £60 if paid within 14 days). That's £2020, or £38 a day between two vans. 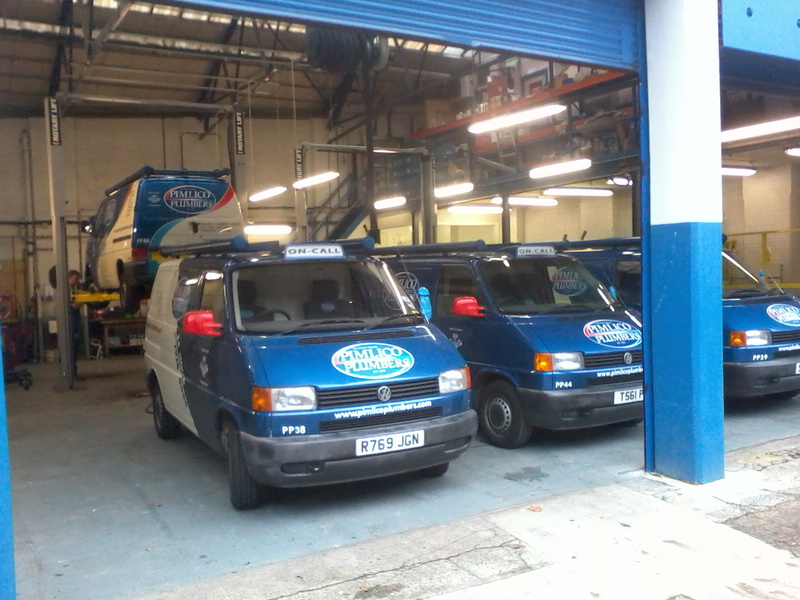 So the going rate for a top London pitch, with no requirement to pay council tax on it, is £19 a van a day. That's a very attractive proposition. 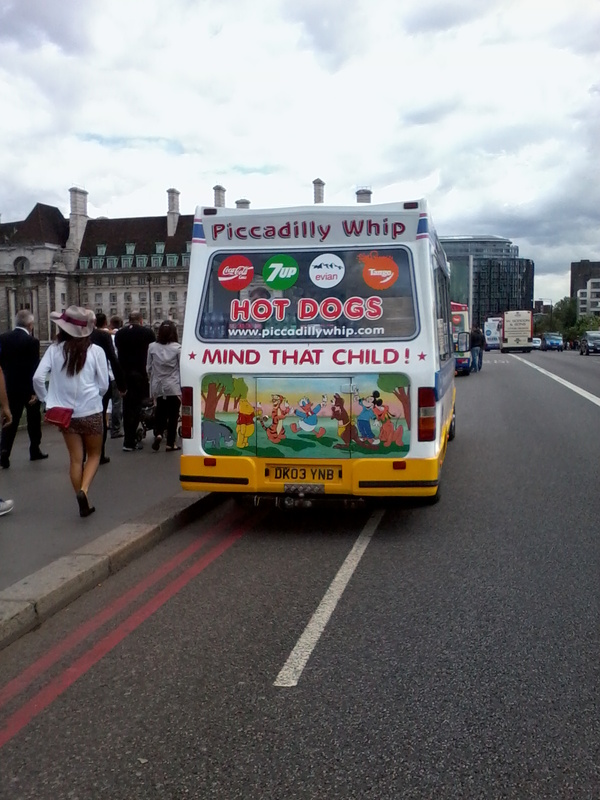 I wonder how much ice cream vans cost and whether the competition are aggressively protective of their dodgy pitches? 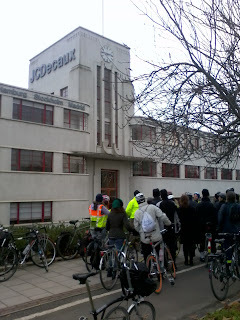 There was an impressive turnout at last night's meeting for a prospective Vauxhall BID (Business Improvement District). The first speakers gave what I found to be a waffly and unfocused presentation on the new campus style American Embassy. I was pleased to see a couple of the new sketches of the Embassy and local streets featured people on bikes, while the first images published of the Embassy and its location showed none. 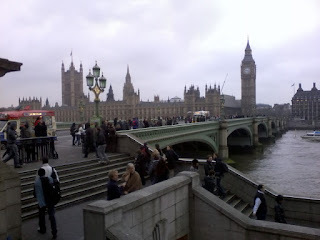 Key points were that the budget doesn't currently extend to the pedestrian and cyclist bridge over the Thames by the Embassy, and that they expect to break ground in 2013 and move in during 2017. A better presentation was given by John McNulty, Head of Interchange at TfL. 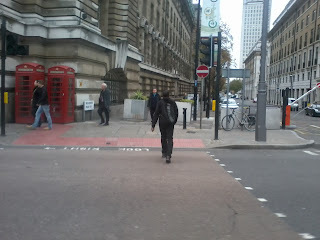 His role is to sort out all those places where tube station meets bus station etc. Nearly everything meets at Vauxhall Gyratory so this is certainly his domain! He emphasised the need for an emphasis on walking and cycling, noting the poor quality of the environment for both pedestrians and cyclists, the fragmented nature of the area for these groups and the very low pedestrian counts. Unfortunately for these groups the gyratory is felt to function very well in vehicular traffic terms, so he said that it's unlikely to go. - a contra-cycle flow on Harleyford Road (though he forgot to mention that Cycling Superhighway 5 will go via the Oval, through/round the gyratory and over Vauxhall Bridge next year, also no mention of quality cycle parking or Boris Bike extension). He noted the first stage of work on improving the bus interchange had been done in 2004 and that due to the current financial situation the next stage should not be expected to happen for quite a while. 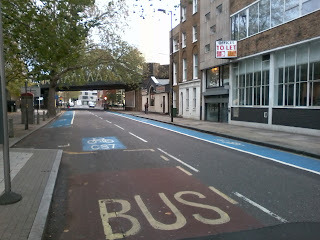 - 2 way for buses and cyclists only in Parry Street. The impact of doing some of the changes is modelled to be a 17 - 35% motor traffic reduction in AM and PM peaks. Given that the gyratory is currently felt to be a success in moving loads of motor traffic around, I doubt that they'll be much enthusiasm by the present Mayor and Government to view that kind of impact as a positive thing to go for. e) Pedestrian and Cycle Bridge. He's looking for a better balance between motor transport and pedestrians, however it's up to the Mayor as to how whether and how much he'll accept the impact of reducing motorised transport. 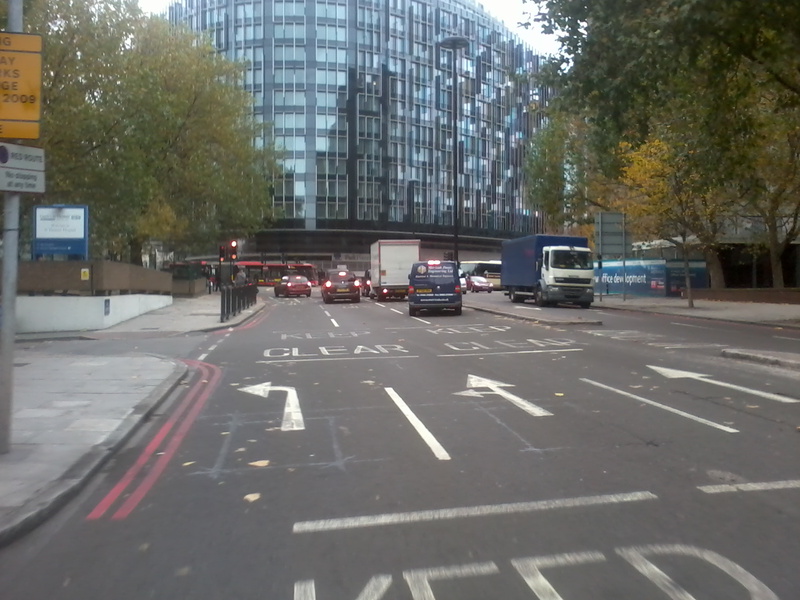 It seems to me that we appear to be stuck with trying to make Vauxhall really pleasant while it remains a mega traffic gyratory. At least I got a chance to push for the area to become the new Amsterdam and also that there is a local desire to see significant urban realm improvements made. It's worth noting that the company managing the BID process surveyed 90 local businesses and Congestion/Traffic was felt to be a serious or significant issue for 35%, while the largest single issue was Overall Image - 43%. Asking what the BID could do for the area, 32% felt measures to support cyclists were important, while the largest single issue was having Street Wardens - 43%. - connect the station with the rest of the area through building modern elevated walkways (citing the architect Jean Nouvel). Waterloo cars - happenstance or result? 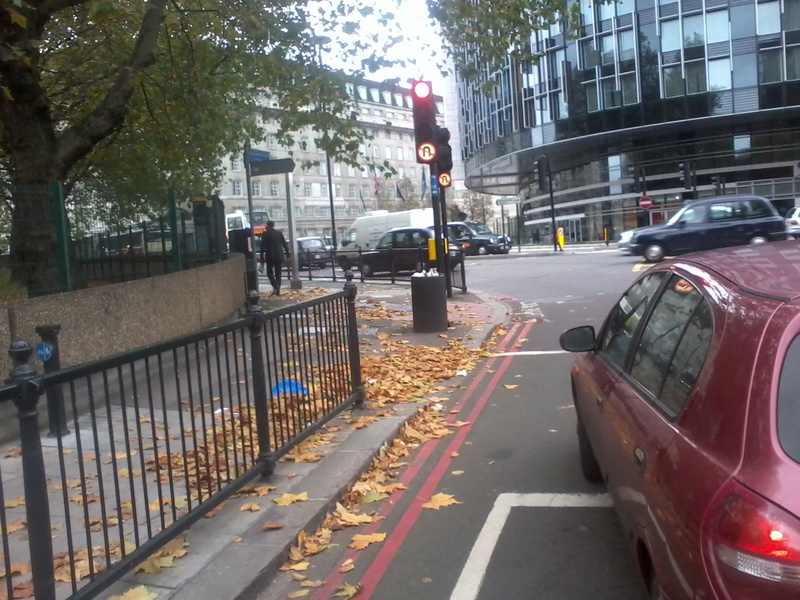 Well done to all those people who complained to TfL's Taxi and Private Hire office about Waterloo Cars's mini-cabs parked on the yellow line and in the mandatory cycle lane on Cycling Superhighway 7. 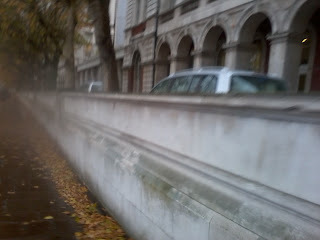 I haven't been that way for a few days but at 09.45 today it looked like this. Fingers crossed for the future. Lambeth Council are working on their scheme to provide secure on-street residential cycle parking. 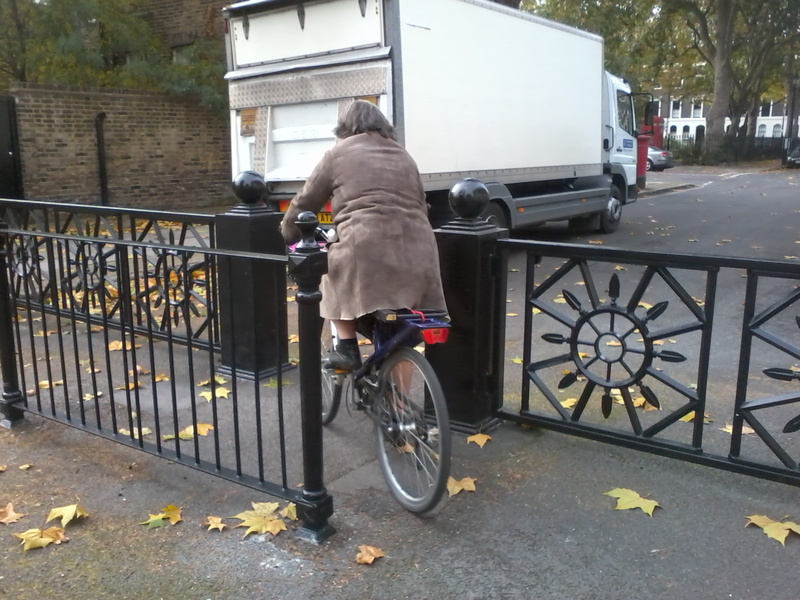 A trial installation of a 'Fietshangar' in Bonnington Square, Vauxhall moves steadily nearer, with a planning application to be made within a few weeks. The Fietshangar will hold 5 bikes, take up half a parking space with the other half being where you stand to put your bike in/take it out. 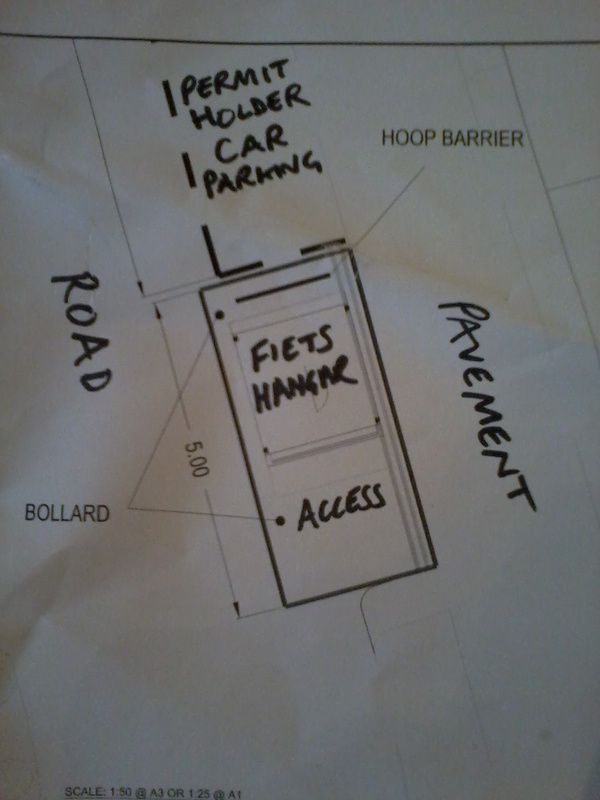 Last night local residents met the borough's officer to discuss how the fietshangar would be maintained, how much it would cost to hire a space, how applicants for scarce spaces would be selected and more. 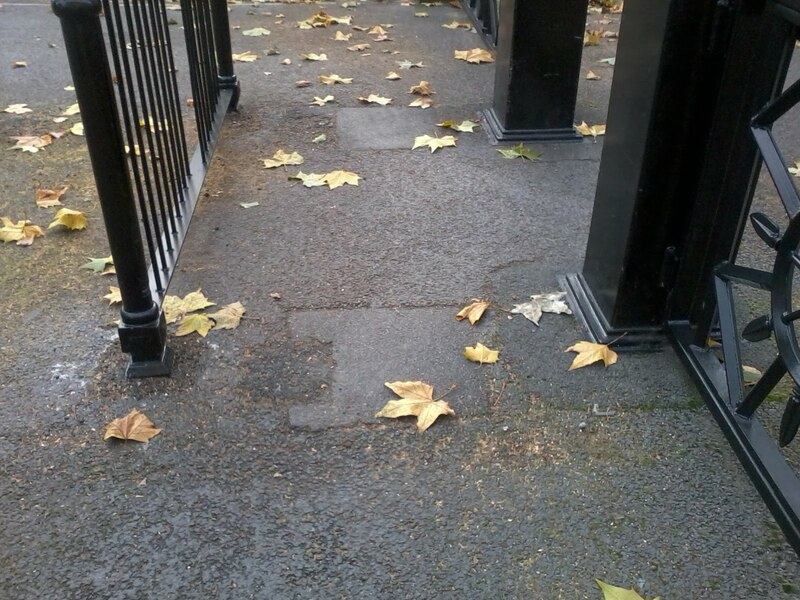 It's fantastic that the residents and officers are working on getting the detail right. 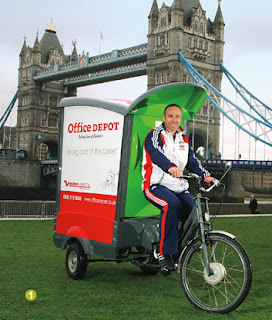 If it was just a one-off not a pilot, it could prove tempting to make life easy by buying an old Luton van with an MOT and tax, buying a residents' parking permit and using the van to keep bikes in. 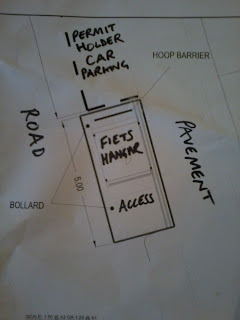 The Fietshangar is worth the effort though, not least because it looks much better - apparently it'll be deep green! Pedal Power Kennington has a 'One Planet living' approach. 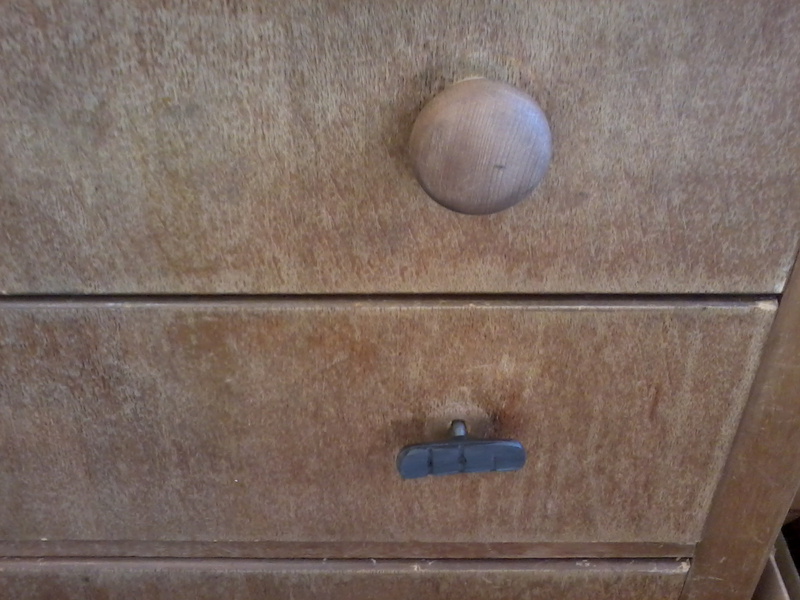 We'd picked up a dumped chest of drawers missing most of its knobs and we came close to losing nails when opening drawers. Dave had a moment of inspiration and found that worn brakes pads screwed straight into the holes! 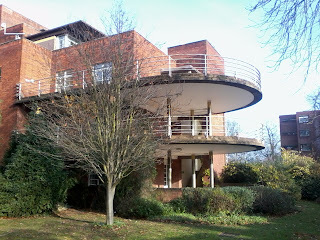 What a great, if aesthetically controversial, result. This was just one of many inspired diy contributions Dave's made recently, making him even more deserving of the title. An entertaining juxtaposition of signs by National Cycle Route 4. 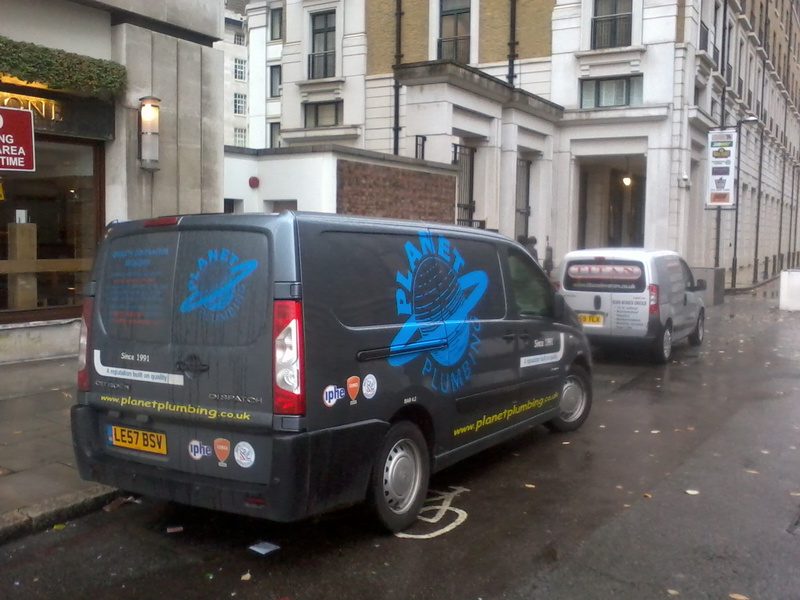 Don't know what excuse the other van's driver has though. Do you like to live on a traffic infested rat-run of a street covered with ineffectual speed humps, and would you rather it was a tranquil, less polluted street that is only used by drivers coming to park where it permitted? This haven of tranquility is Trinity Street, a short rat run between two major roads; the A3 (Borough High Street) and the A2 (Great Dover Street). See the map here. Can you imagine how much this partial road closure, allowing cyclists to filter through, has increased the quality of life (and the price of the houses) since it was put in? I bet there were some residents who couldn't envisage these benefits and opposed plans for the closure because it would limit their options for driving in and out of their road thus adding a couple of minutes to some journeys. Given there's a chance of this kind of opposition to partial road closures, a council is likely to have a default recommendation for less contentious but much less effective traffic calming measures, such as putting in speed cushions. If you're in favour of a partial road closure in your street it's worthwhile checking out successful ones in similar situations and taking local sceptics to see them, and maybe talk to people who can describe the before and after. Mind you, for a period one barrier had been installed too close for comfort to the others to give a sensible gap to cycle through - below you can see where the post holes were now filled with tarmac. 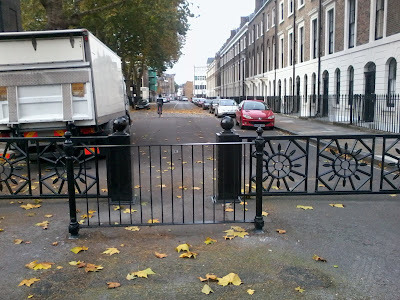 So kudos to Southwark Council for relocating the barrier . 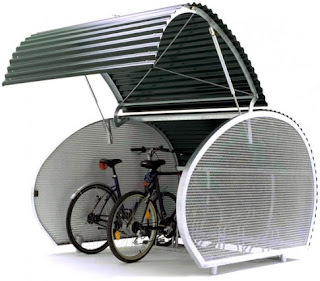 I'm very impressed by Dawn Rahman, Lambeth Council's Transport Policy Manager, and I see that the equally impressive 'Lurking About SE11' is too - reporting excellent feedback provided in response to that site's suggestions on locations for docking stations. a) Brook Drive towards CS7 end - plus on-street cycle parking for residents - unfortunately the end by CS7 is Southwark so I can't personally progress these but can mention them to TfL. I've also asked Richard Ambler about possible cycle stands on Brook Drive (again unfortunately it could only be the Lambeth side - such as we are tied to borough boundaries). In terms of removing car parking on the Lambeth end of Brook Drive, we did have a look at this previously but the parking stress seems quite high and we didn’t progress it. I think the fact that the one opposite the Imperial War museum is so close to the Lambeth portion of Brook Drive that we probably wont be able to take this one forward. This was really interesting reading these. We did have a site planned on the public space between Oval and Kennington Park but we lost it at the implementation stage due to stat covers etc, which was a real shame. I keep re-looking at that area and I think the best option is to loose car parking on Kennington Oval (the end as near to the tube station as possible) - but not sure how popular this would be with residents- although according to our development control team the parking stats are very low in that area so I think this is a good suggestion and one I want to progress. c) Right next door to secondary schools (as at Lilian Baylis on Kennington Lane) - encourage secondary school kids to cycle to school. London Nautical is in the area ((Stamford Street). Work with School Travel Plan Mgr to push into schools. 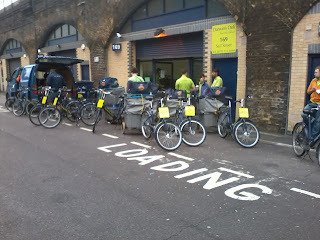 Had a look at London Nautical - but struggled to see sufficient space to fit a 20 bike docking point unfortunately. The only other option is much further down by the Coin Street building but then it is very close to the other docking station. Hmmm- we did discuss the problems of this road at a meeting today with TfL, and they said they would try to see if they can get any pressure put on the owners to make this road more 'cycle friendly' but I can't realistically see this happening in line with the TfL deadlines I have been given to progress new sites! We looked at this site originally a couple of years ago, it would seem the whole area was due to be developed into flats for nurses etc so we weren’t able to go ahead with a site at the current time. I've just spoken with our planning section and they say that the initial plans have been put on hold due to financial constraints but that there are still possible plans to re-develop. But this might not happen for a while, so it wouldn't fit in with the tight timescales TfL are asking to progress the site currently. On the upside there should be one on the other side of the road in the hospital grounds going live very soon. I'm going to keep Royal Street on the agenda though as agree it is an ideal location. Will also speak to Richard A about the two way issues. f) Lambeth Walk outside the large doctors practice - plus big push with staff there to get patients to use them. I really like the idea of this one in terms of links to health etc for patients and will look at having this as a contingency site, due to the close proximity of the Lollard Street docking point. For some reason according to the usage figures from TfL Lollard Street is one of the least used sites. 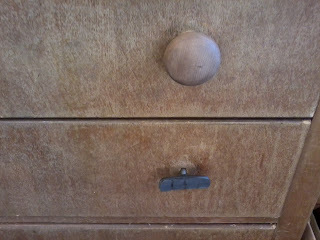 I'm unsure as to why this is not used that much as thought this would be a good location. 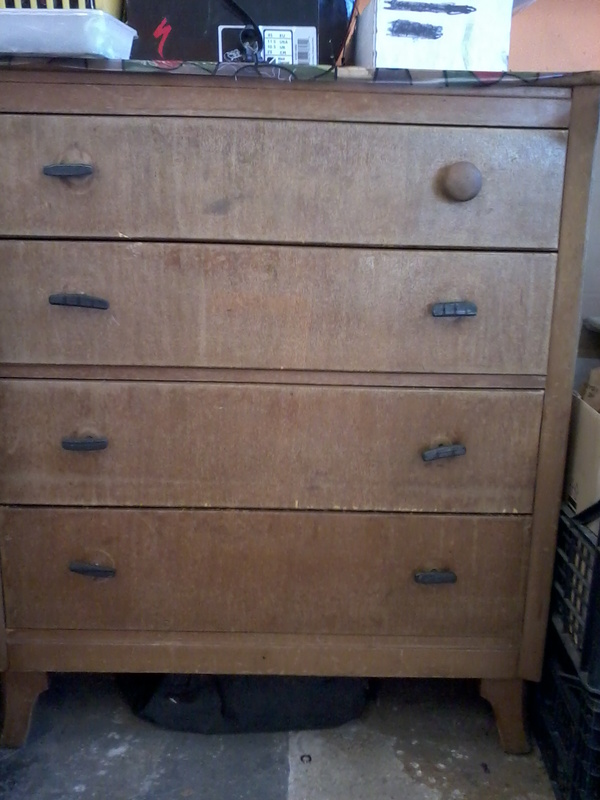 It might be worth delving into why this one is not being used. Although I have asked TfL for some recent usage figures as the ones they provided were up to mid Sept, so it may have improved since then. g) Kennington Road where there's no cycle parking although it'd probably be better just to put a Sheffield Stand outside every shop. 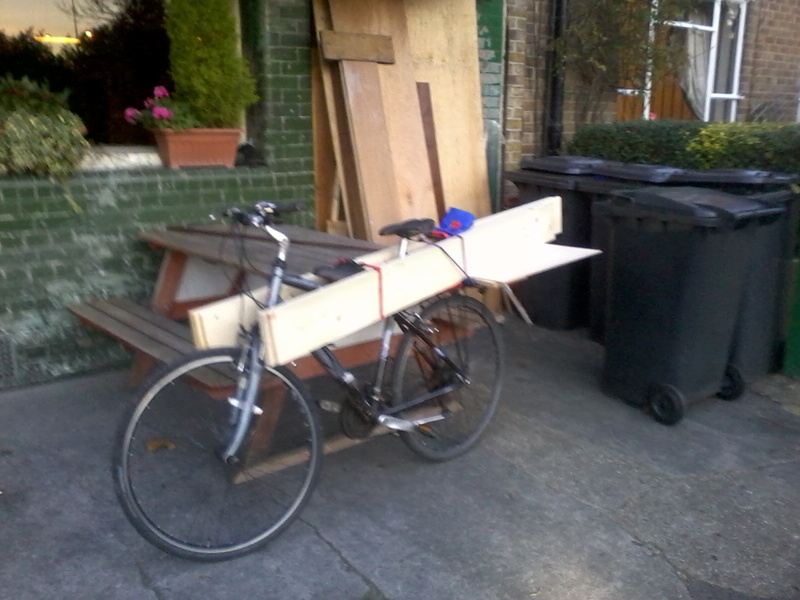 Unfortunately as this is red route we're not allowed to put any cycle parking in (frustratingly for us). I'll speak to TfL about this area again. We did progress a site close by on Windmill Row but there were too many objections and planning approval was not allowed. I think I'll have another look here as I'm conscious there is such a big gap in the network between the post office and the next one up by Kennington Cross. 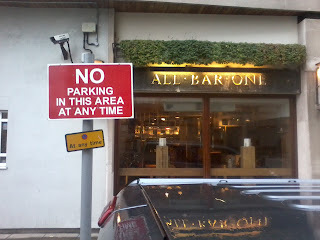 h) Cottington Street - with ancillary permission measures . Again like the idea of this as might encourage both residents and users of northern line to jump off at Kennington but I just can't see where we could put it without taking up too much footway space. 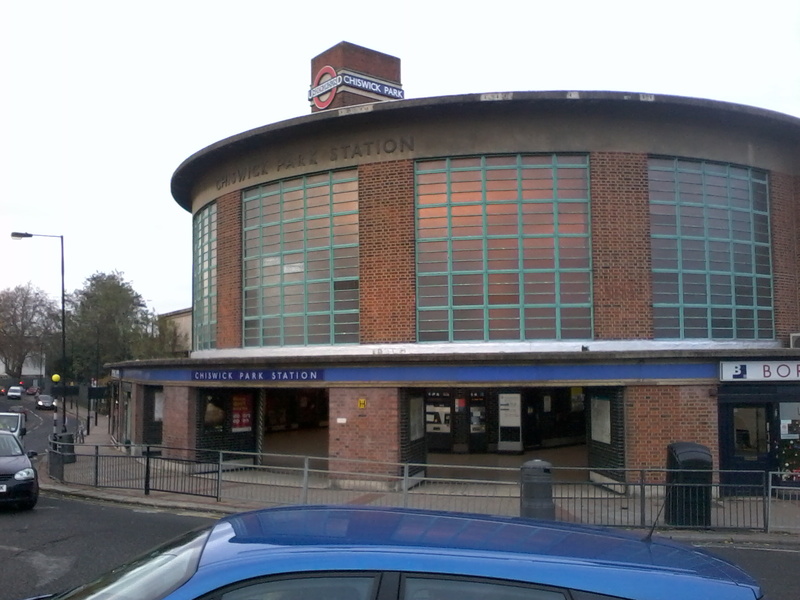 We could potentially get a small station on the area that acts as a division but TfL wont progress smaller sites anymore so I just don’t think we can fit a 20 docking point station. 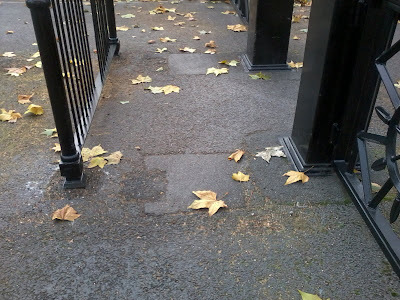 i) Cleaver Square on Kennington Park Road entrance. 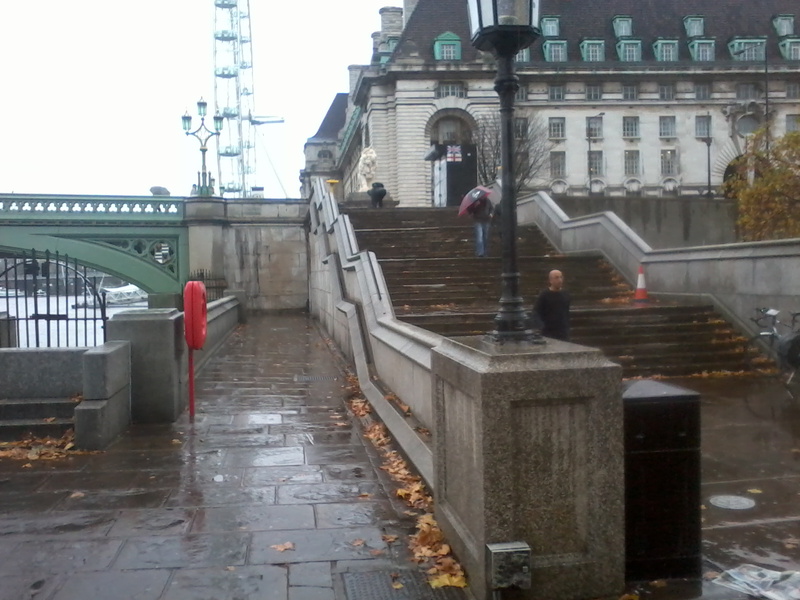 How about using the existing Toucan from Belvedere Road over Westminster Bridge Road to lead to a new ramp running from the top of the stairs (shown below) where I took this picture to the elevated road (above) that runs along the wall beside the existing Thames Path. And the beauty of it is that the road belongs to St Thomas' Hospital who are particularly concerned about the safety of Thames Path users and a member of the NHS which is desperate to have people adopt a healthier, more active lifestyle to cut down on their costs. I can't imagine why they haven't done it before. The massive population growth planned for the Vauxhall, Nine Elms, Battersea area comes at the same time as governments and major corporations strive to reverse our destruction of the earth's biodiversity, control our carbon emissions, fight diabetes and heart disease and so on. The pressure is clearly on the powers to get ordinary people - mums and dads, children, pensioners and commuters - to choose walking and cycling over powered forms of transport for journeys of up to about 6 to 10 miles. So, what determines where ordinary people like to ride a bike and where they don't? 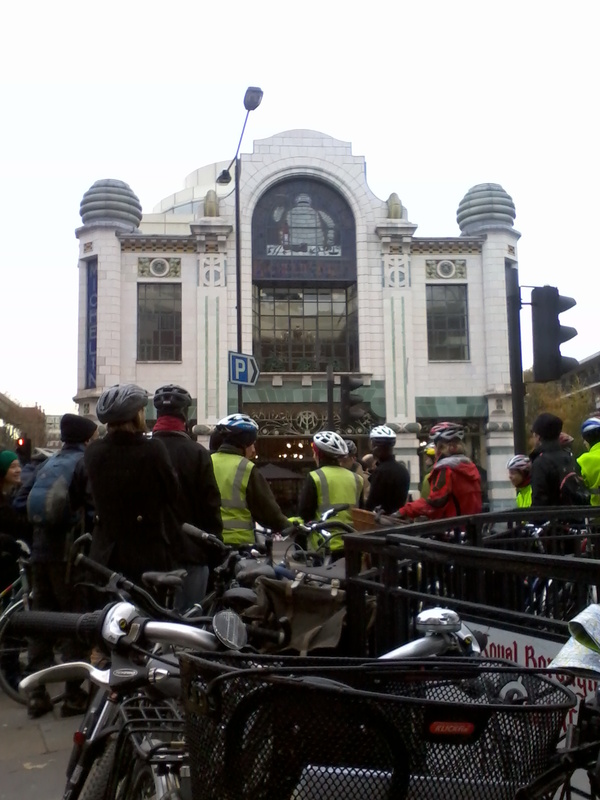 What changes could be made to our infrastructure to increase cycling over motor vehicle use? 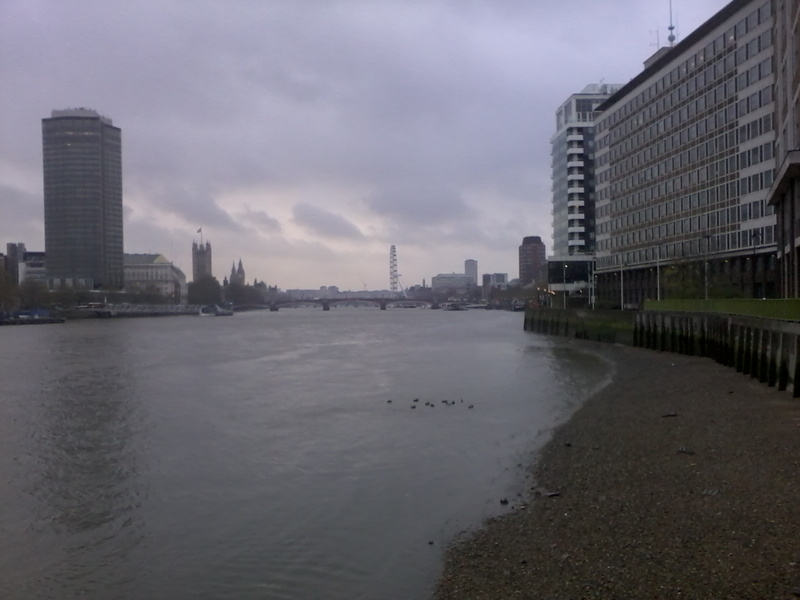 The DfT's experts have identified five Key Design Features, and it is illuminating to contrast the Thames Path (TP) with the parallel National Cycle Network Route 4 (NCR) for the stretch from the Albert Embankment to Gabriels Wharf. Below are my comments and my scores for each of the features, out of ten. and Comfort: Cycle routes need smooth, well-maintained surfaces, regular sweeping, and gentle gradients. Routes must be convenient to use and avoid complicated manoeuvres and interruptions. 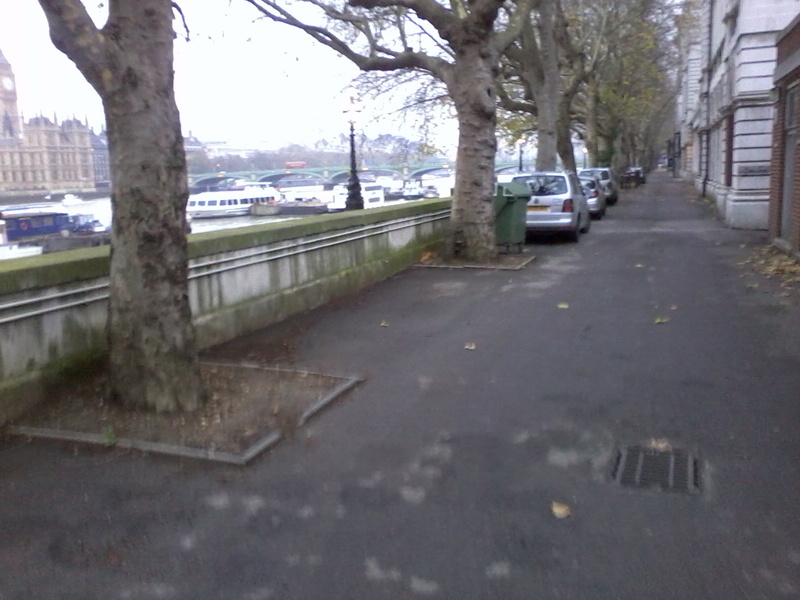 If I was a member of government or a local business (or Hospital Trust) and I wanted to get more ordinary people walking and riding bikes more often, I'd be busting a gut to bring NCR 4 up to the exemplary standard of the Thames Path while enforcing considerate cycling on the latter. 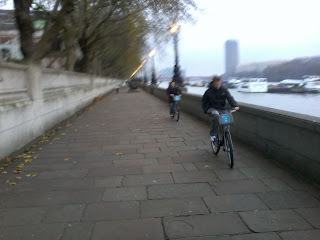 Let's see what the finalised South Bank and Waterloo Cycling Strategy has to say on the subject when it comes out. Lambeth Council is inviting people to get involved in shaping culture in Lambeth. They seek views on a discussion document towards a cultural strategy. 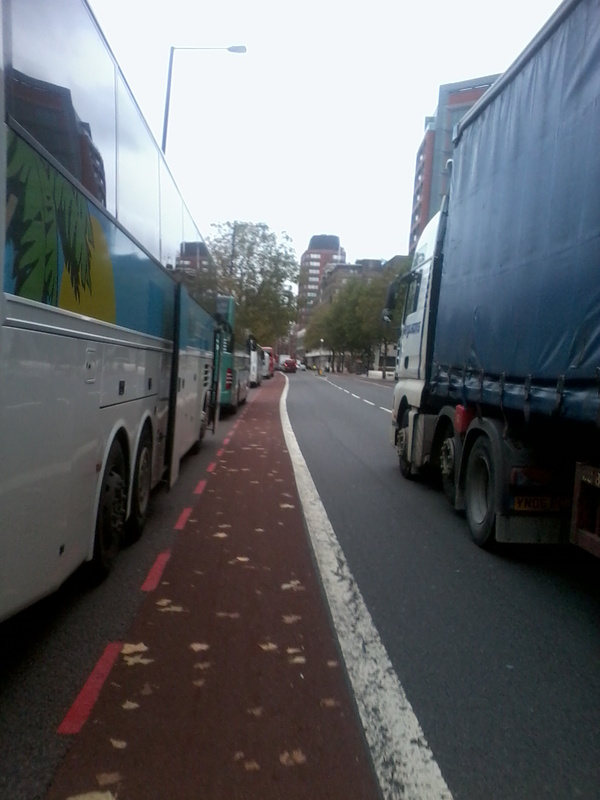 The draft South Bank and Waterloo Cycle Strategy had nothing to say about the major roads and roundabouts that form part of NCR 4 - a significant omission that Lambeth Cyclists highlighted in their response. I hope that when the final strategy is published it includes clear proposals on how to continue to develop National Cycle Route 4 in the South Bank area. Apropos my blogs about Waterloo Cars, I've been told about a new site mybikelane.com to log illegal parking, and that a Kennington meeting is planned for the 9th November. 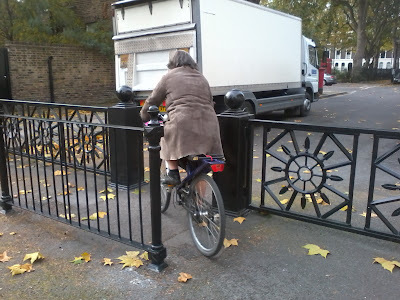 In a letter that Kate Hoey sent to a constituent in defence of her proposals to install No Cycling signs on the Thames Path she states, "There is of course an excellent cycling route on the main road along past Lambeth Palace and the hospital." Ms Hoey is referring to no less a source of civic pride than National Cycling Network route 4 that runs all the way from the western tip of Wales to Greenwich. Taking the glowing testimonial from the local MP and the national status, parents would surely have no hesitation about letting their teenage daughter venture out, unfettered by parental presence, to use it in preference to the Thames Path. I've emailed a few local parents to ask if they'll send their children out to considerately cycle the National Cycle Network from Black Prince Road to Gabriel's Wharf, returning via the Thames Path, to get their comments on each. (I'll also be intrigued to see what recommendations about this route are in the finalised South Bank and Waterloo Cycling Strategy.). If you have teenage children then I'd ask you to consider asking them to ride these parallel routes, dismounting where they feel it is appropriate for their safety or the safety of others, and report back via the Comments page. 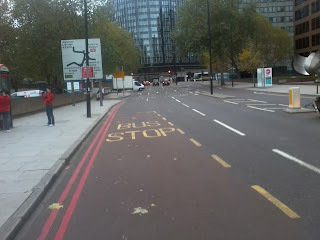 They can follow the NCN 4 signs but if in doubt, the route goes along the Albert Embankment, over the roundabout at Lambeth Bridge, along Lambeth Palace Road, past Westminster Bridge to Belvedere Road and along to finish on Upper Ground by Gabriels Wharf. I'll report back on progress from those I've asked. In the meantime here are some pictures I took yesterday mid-morning of the specific bit that the MP refers to. Is an outright ban really the only way forward? 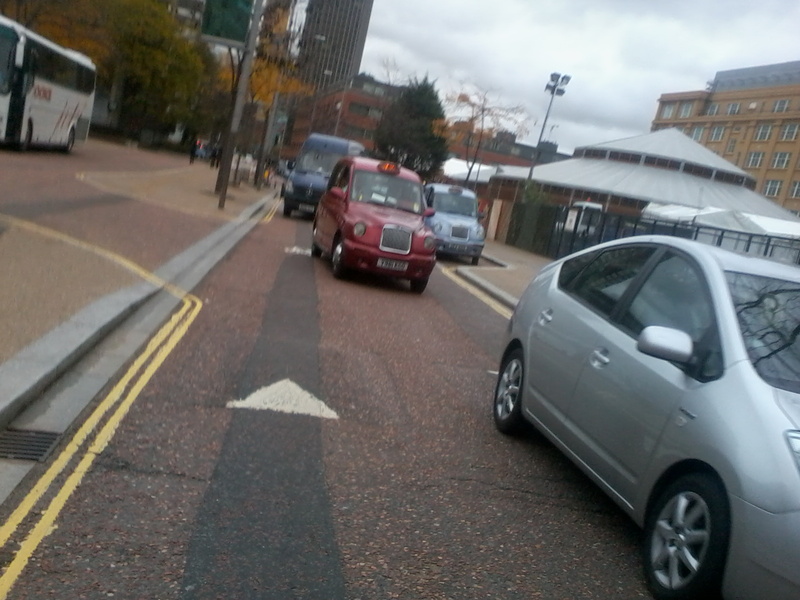 How do Waterloo Cars get away with it?